The rain cleared sufficiently for us to hold our first moth event of the year at the MWT nature reserve, Roundton Hill. After the cold winter, moths have been slow to emerge this year but we were treated to a typical catch of Montgomeryshire spring-time moths totalling 15 macro and 4 micro species. One surprise was an early record of The Diamond-back moth - Plutella xylostella - quite possibly an early migrant from abroad. Other highlights of the evening included non Lepidoptera sightings of palmate newt and best of all (for the one of us that saw it anyway) a polecat that approached a moth trap for a sniff. The observer (standing downwind) was only 5 yards away! With refreshments provided throughout the evening, plus the usual banter, a thoroughly enjoyable evening was had by all (that is, except the courting couple, who's car we surrounded in what is normally an empty, quiet and dark car park!). Well, what seemed on the surface to be a pretty straightforward event nearly turned into a non-event. On this occasion, Jane picked up me and all the equipment. I was grateful for this as I hadn’t been too well of late and was very happy not to have a fairly long return car journey. We set off chatting about what might turn up during the evening, it had been another lovely day so we were in high hopes. After about half an hour of driving I screamed out to Jane, ‘Oh my god, I’ve forgotten the cable drums’. Jane screeched to a halt, we had to decide quickly what we should do. It really was too late to turn back so we phoned Mike in the hope that he hadn’t left yet and fortunately he had some cable he could bring. Also, Chris always had traps and cable with him, so we took a gamble and carried on to the event, with our fingers firmly crossed. As it turned out, between us all we managed to run all the traps, even Deborah had remarkably turned up with a cable reel to return to Jane! Unfortunately, we couldn’t set up the white sheet as this needed a special adaptor that was attached to one of the cable reels, but thankfully, the day was saved by everyone rallying around. As we set up it soon became apparent that the lovely day was going to turn into a clear cold night and the probability was that the catch wasn’t going to be very big, but of course there’s always a chance that one or two interesting species will turn up. Ten people braved the cool conditions, mostly regular moth group hardy souls and Vicki Hogarth from Radio Shropshire who wanted to do a piece on mothing for her programme (fortunately the great cable debacle had all been sorted out before she arrived, otherwise she might have thought we were a bit of an unorganised shower). Moths started to arrive, slowly at first but then a steady stream was brought to the table for identification. Notable species were melanic forms of Diurnea fagella, and Brindled Pug; the stunning Frosted Green and Oak Beauty, the Lunar Marbled Brown also raised an eyebrow or two. About half-way through the evening an absolutely immaculate Waved Umber turned up, a splendid moth to see for its camouflage colours, also a Dark Chestnut was brought to the table (this was probably the best record for the evening as it isn’t recorded too much). As the evening activities drew to a close and we started to pack the traps away a Red Chestnut on the floor of a trap brought the night’s trapping to a close. Not a bad list, especially for cold conditions and I’m pleased that Vicki had a few nice mothing moments to talk about on her radio show.. The non-lepidoptera highlight was the finding in good numbers of a red beetle, Pyrrhidium sanguineum (Welsh Oak Longhorn), a UK Red Data Book listed species. Thanks to all those who brought along hot drinks and biscuits, just what the doctor ordered while waiting for the moths to turn up. This year’s National Moth Night theme was to be moths and bats, in a joint venture between Butterfly Conservation and the Bat Conservation Trust. The night time temperatures had been particularly cold in the run up to NMN but the forecast was for cloud rolling in from the west later in the evening, so we all had our fingers crossed. In the event, the cloud didn’t arrive until the trapping had finished, so we had clear skies with falling temperatures, tough trapping conditions. After an initial talk on bats by Grace Crabb (the head of the biology dept. at CAT) we all went on a bat walk around the grounds. The bats put on a decent showing despite the cold. Pipistrelles emerged from their roosts and could be heard well on bat detectors and seen feeding among the trees (to the music of a live band which was playing elsewhere on the site!). We got back from the bat walk to the glowing bulbs of the moth traps and very soon the first moth of the evening was brought to the table, it was a Brown Silver-line, a very common species whose larva feeds on bracken. This was soon followed by the common Diurnea Fagella the only micro moth of the night. Other species turned up slowly throughout the evening, but the trapping was very hard indeed. The best species of the night was probably a fresh Rustic Shoulder-knot which is a species that is only found locally in the county. As we were packing the traps away the very last moth of the night was a stunning, fresh, Lesser Swallow Prominent. Unfortunately there were only a few of the hardiest amongst us, left to see it. Our first three events of the year have all been on cold nights, with pretty poor results, I do hope our luck changes for the next event! With the first three events of this year falling on cold, adverse conditions we were really hoping that the Pont Llogel trip would make amends and in the event we weren’t disappointed. As we set up the traps there was a buzz of anticipation that we were going to have a good night. The ‘buzz’ by the way, was echoed by the swarms of midges that set about us as dusk approached, I thought Mike was going to hang out the white flag at one point, but after a while they left us alone and we were able to enjoy the evening. Even before the lights were switched on there were moths flying around and the first species to be potted was a Green Carpet. A few other common species followed before a stunning Beautiful Snout was brought to the table (only the 4th site recorded in the county), it certainly was a thrilling moment for all. The moths arrived at a furious rate and other notable species were White-pinion Spotted (5+), Campion (2), White-spotted Pug, Small Seraphim, Shears and the striking Green Silver-lines which always raises an eye or two. Undoubtedly the best species of the evening were the 4 Clay-triple Lines (9th county record for this species) that were recorded throughout the session. In all 62 species of macro moth were recorded during the evening. The white sheet was once again a good focal point with everyone gathering around to easily observe moths which were settling on the sheet. Of the 7 species of micro moths that were recorded the most notable were the Capua vulgana (2) and Evergestis forficalis (Garden Pebble). At 2:00 am we finally finished for the night and I’m more than sure that the seven of us who attended the event all had an excellent evening and many of us saw species that we hadn’t previously seen which was great, and of course many thanks to Jane for providing the tea and biscuits which kept us all going amid the frenzy of moths. The day before the event the weather was cloudy and humid.The temperature was 20c. Conditions were right for a large haul and so it turned out. As we set up it soon became apparent that the midges were going to play a large part in the evening’s proceedings. I've never known them to be as bad before. We were all plagued with them throughout the evening. Mike’s hands and face were bitten to pieces, Liz and Ken gave up and left early - driven off by the midges. If that wasn’t enough, the skies became more menacing, the heavens opened and it rained heavily for about an hour or so. Everyone was rushing around either to escape the midges or to take cover from the rain, the term ‘mad moth-ers’ certainly came to mind. But then as I’ve already said, the conditions for moths were excellent and it wasn’t long before they were lured towards the traps. The area was a frenzy of activity, the white sheet was so thick with insects that you could have called it a black sheet. Moths were brought to the table thick and fast. Dark Arches led the way and it wasn’t long before Beautiful Snout turned up. We had several Pug species including Triple-spotted Pug and Larch Pug. A stunningly fresh Iron Prominent was admired by all and then Bordered White hogged the limelight. Satin Lutestring was another excellent find. The moorland species Scarce Silver Y made an appearance as did Welsh Wave, both of which are local species. Other noticeable species were Large Emerald, Gold Spot and the increasingly uncommon Tawny-barred Angle. The best species of the evening was the Gold Swift which had only previously been recorded at two sites in the county. As for the micro moths, the most ubiquitous species was Aphelia paleana. The two best micro species were Gypsonoma sociana which had only been recorded on three previous occasions in the county and Tortrix viridana which has only recently been recorded again after twenty years. Other notable species were Scoparia pyralella, and Argyresthia brockeella. It was certainly an excellent evening as far as the mothing was concerned, but it was made increasingly unbearable and unpleasant by the midges. As Mike put it, ‘On one hand I can’t bear to go, on the other I can’t bear to stay’. What a dilemma! Four of us did stay to approximately 1:00 am, and when we finally decided to call it a night, the weather had a final say and it rained again just as we were packing up. It had been drizzling lightly all day, but I didn’t see any reason to call off the event, conditions were looking very favourable for an excellent evening of mothing. Luckily when I arrived at the venue the rain stopped long enough for me to get set up without getting wet, but thereafter it continued to drizzle for the rest of the evening. After an initial short talk, the trap lights went on at about 9:15 and it wasn’t too long before the moths were coming to the table and enthralling the 35 people who turned out for the event. First up was a Large Yellow Underwing, shortly followed by a Crescent (which seem present in good numbers at the reserve). Our smallest macro moth, the Marsh Oblique-barred also put in an appearance (this one catches many people out, thinking it’s a micro moth). The very local but stunning Scallop Shell raised a few eyebrows, as did a pristine Sallow Kitten. A singleton of the Southern Wainscot (which only seems to be recorded at this reserve in the county) poked its head in a trap, and the sizeable Bulrush Wainscot also showed up. Several Prominent species, including Pebble, Iron, Lesser Swallow and Pale, made an appearance and an exquisite Large Emerald was seen towards the end of the event. The most notable macro species of the evening were a migrant Dark Sword-Grass and the Suspected, but the best catch of the night was the Saltern Ear (a new species for the county). 23 species of micro moth were also recorded, these include Chilo phragmitella and Limnaecia phragmitella both reed bed species, an Acleris caledoniana (an open moorland species), Agonopterix conterminella (only been recorded once before in 1993) and Epinotia brunnichana, which has only been recorded a few times in the county. With 101 species recorded on the evening we were all kept extremely busy with large batches of moth filled collecting pots coming and going. We all had a very enjoyable, if wet, evening. The moth opening event, at the education block in the visitor centre at Lake Vyrnwy, offered a different type of event to the more usual moth evenings. Moths which were caught the previous night by Liz and Ken Jones (who work for the RSPB as wardens) were potted, labelled and set out on tables, along with various reference books, and a skinner trap was set up for the visitors to look at. After an initial talk and questions, visitors spent time viewing the potted specimens and referring to the books. Peter mingled with everyone answering further questions and advising on various mothing topics. The moths on view offered a good representation of mid-August species. Shape and colour of the well camouflaged Scalloped Hook-tip was a general talking point, the Scalloped Oak and Pebble Hook-tip did not go unnoticed either. A rather beautiful Swallow Prominent raised a few eyebrows, but the stunning Gold Spot probably stole the show. The only migrant on the table was a Silver Y. Micro moths were a bit thin on the ground due to the cold trapping conditions, but one of the grass moth species Agriphila tristella made an appearance as did the beautiful Eurrhypara hortulata (Mother of Pearl). As an event it worked very well and the format was good, but if we do this type of event again we should aim for early to mid-summer when there will be many more spectacular species on the wing e.g. the Hawk Moths. This MMG event was joined by Montgomeryshire Wildlife Trust who came with bat detectors to see which bat species were around the site. During the day the weather looked promising with cloud cover and intermittent drizzle, but as evening approached the skies cleared and the temperature began drop. This did not bode well for good mothing, but we hoped that the bats would not be so affected by the cooler weather. A few minutes after the traps were put on all the electricity in the house went off, throwing us into utter darkness. Through a series of isolation tests we discovered one of the Skinner traps was faulty so we had to pack it away and make do with only two traps for the rest of the evening. 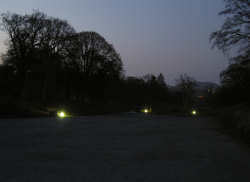 The first part of the evening was taken up with a bat walk led by Tammy and Judy Stretton. Before we left for the walk, with bat detectors on, we found Pipistrelle sp. feeding in the garden area and a Noctule was also recorded flying high. We walked along the lane to the bridge that crosses the River Tanat. Bats were very busy feeding here around the street lighting and, below the bridge, many Daubenton’s were observed circling and skimming over the water chasing insects. We then continued walking along one of the lanes listening to the bats calling, during this time Tammy and Judy gave us a short talk on bat facts in general. Everyone enjoyed the walk and we headed back to Sue’s garden for some mothing. The first moths to arrive were the Silver Y, our only migrant species of the evening and the very common Large Yellow Underwing, both nectaring over Sue’s flower borders. These were followed by a Sallow Kitten which came to the white sheet, everyone was captivated by this beautiful little moth. Next a Chinese character was potted from the trap, a strange looking species whose legs are completely covered by its wings; it always looks like a child’s toy to me! As the evening went on several other species were brought to the table, these included the Flame Carpet, July Highflyer and a rather worn Willow Beauty. ‘Last knockings’ often throw up something good as we begin to pack away and this occasion was no different; a stunning Single Dotted Wave came to the sheet, not an unusual or scarce species, but its markings were remarkably vivid. The last macro moth of the night taken from the skinner trap was an Early Thorn. Micro moths were a bit thin on the ground due to the cool conditions, but two species of ‘grass moths’ did show up, Agriphila straminella and Agriphila tristella and the last moth of the evening was the beautifully marked, iridescent gold, Argyresthia conjugella. It was a great shame that the evening was so cool as the two previous nights had been perfect for mothing, but as always those who turned up made the best of the evening with the usual humour. Thanks again to Sue for hosting an excellent all round event and for her superb home made cakes, along with copious amounts of tea, which was very welcome indeed. Saturday had been a beautiful, clear and sunny day which did not bode well for the evening’s event. Even before I left my house in the late afternoon the temperature was plummeting. Still, never mind, my philosophy is that I’m always up for a challenge, even under the worst of conditions. We set up the Skinner traps just as the sun was setting, only to find that one of them wasn’t working. We tried to sort out the problem but unfortunately, to no avail, so we had to settle for being a trap down for the event. This problem had come to light on the previous event but I had since tested the traps thoroughly and everything was working perfectly well, so it’s back to the drawing board with this one! The white sheet was also set up. After about one bone chilling hour of no action at all, the first moth came to the white sheet, it was a Yellow-line Quaker and another hour later the last moth of the evening a Black Rustic and gave itself up. We stayed on for another hour or so, but apart from the Black Rustic who occasionally came back to the sheet (I think it felt sorry for us) absolutely nothing else was on the wing, so we finally surrendered to the elements. It was probably the ice that had formed on one of the kit bags that was the final straw for me! As the evening drew on, the four of us who had been mad enough to go mothing in these conditions were slowly turning to blocks of ice, it was only the chat and banter that kept us going. I did rather have visions of someone finding four frozen bodies on the moor the next day. Llyn Mawr is an excellent site with much potential, so we will go there again, but we’ll choose a summer month next time. If the weather forecast had been correct, the last event of the year at Dolforwyn Woods could very well have turned out like the previous event at Llyn Mawr i.e. very cold, but as it was, we had enough cloud cover to hold the temperature up, therefore the event was very well attended by moths! Once again the white sheet proved to be the most effective method for attracting the moths and it wasn’t long before the first species of the evening arrived, this was a Chestnut which was swiftly followed by the much more uncommon Dark Chestnut. The beautiful Green-brindled Crescent and the Satellite were also early to arrive. As the evening progressed the Red-green Carpet, the Brick and the Feathered Thorn were brought to the table. By the end of the evening, all the Epirrita Sp. (November moth Sp.) had been recorded. The best macro moth of the night was the very distinctive Figure of eight which seems to have a very patchy distribution throughout the county. The last species to arrive were Mottled Umber, Spruce Carpet and a Beaded Chestnut which pushed the total species for the night up to 18 which is very good for a mid October event. Only two species of micro moth were recorded, an Acleris rhombana and an Ypsolopha ustella. Seven hardy souls turned up for the event and apart from the moths which kept us very busy, the refreshments also went down very well and thanks to everyone who brought all the goodies and drinks. It was definitely an all round end of season bash.